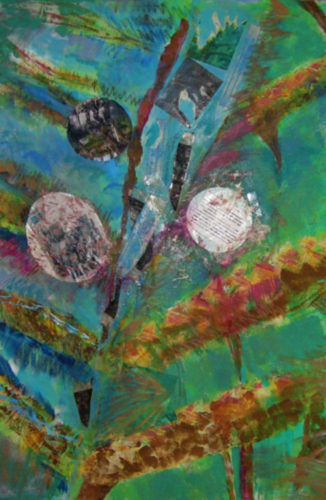 Seeing Through The Painter’s Eye, an essay by Carole Steinberg Berk wa s published in Fourth Genre, Volume 7, Number 2, Fall 2005 and then was published with the essay and “Evolution of the Painting” in Still Point Arts Quarterly Fall 2012, Issue No. 7. As a visual artist, many of my photographs are studies for my large paintings. And so when I looked through the lenses of my digital camera to take this picture, I imagined the scene I was photographing as a richly colored landscape painting on a large framed canvas. The pond and surrounding foliage represent some of my favorite images: palm trees, a blue heron that looks like it’s posing for me, and reflected shapes of tree trunks in the rippling water. Just before I pressed the shutter, I found myself looking more closely at the balance of the composition. I was seeing beyond the surface of the landscape as though I had x-ray vision. And the shapes, lines, and textures I use in my paintings seemed more vivid and immediate to me than the actual scene itself. 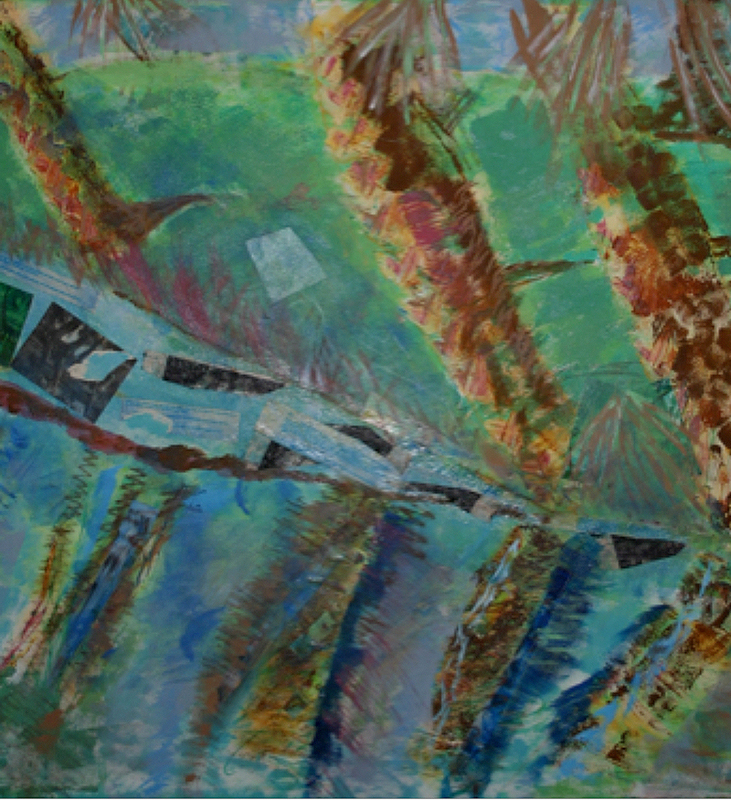 After I transferred the color photograph to my computer screen I discovered that the original landscape had become transformed into a series of related surprising images that looked more like an abstract painting than the realistic photograph. For example, in place of the broom-shaped leaves on the palm trees, I see a cluster of uneven lines. 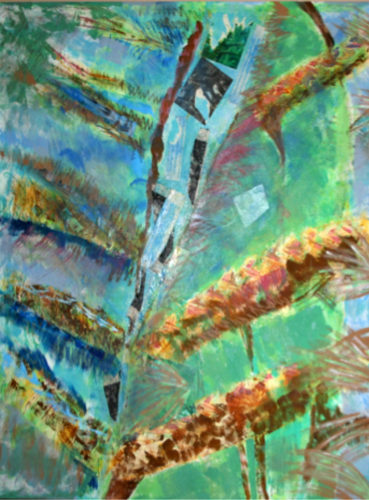 In addition, the blades of grass punctuated throughout the landscape have become abstract shapes. Moreover, the relationship of the land to the body of water now gives the scene more balance and harmony. More specifically, the reflections of the trees in the water become a combination of thick and thin diagonal lines dancing across the water. And the branches on the top border of the landscape are thin and uneven light colored lines, thereby directing the viewer’s eye toward the pond. The surprise of discovery is what draws me to both painting and photography. When we approach a subject for the first time we don’t always know what the results will be. For a visual artist like me, this process must be the equivalent of what a writer goes through when revising multiple drafts of a creative essay. The image on my computer screen is, in effect, my first draft. My second draft is the transfer of the landscape from a color image to the black-and-white image that appears on the cover of Fourth Genre. The final draft, as seen through the painter’s eye, is dominated by textures and vertical and horizontal lines in halftones, as opposed to the realistic images of grass, leaves, and tree trunks that the photographer might see. As I look at the photograph now, I imagine that each palm tree trunk in the reflected water is made up of thin horizontal brushstrokes. I also see that the unevenness of the ripples gives the trunks a feeling of movement. 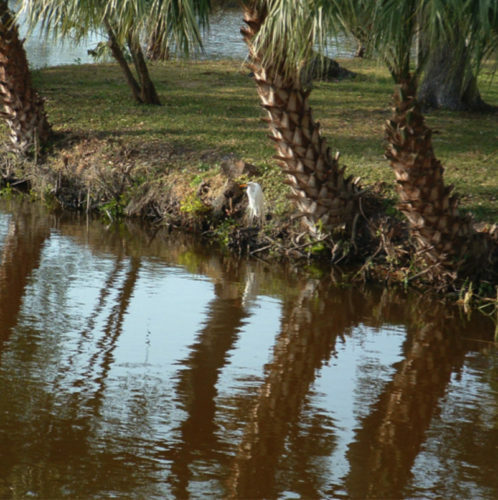 And the trunks of those palm trees at the edge of the pond look like individual triangle-textured shapes clustered together. And because of the weight of the shapes, the trunks look as if they are leaning forward. As a result, I am no longer seeing just a photograph that documents the landscape. Instead, the photo becomes a catalyst for my imagination. Which is to say, the lines, shapes, and values I would ordinarily associate with an abstract painting have now become the main focus of my attention. appeared in Still Point Arts Quarterly, Fall 2012, issue No. 7 along with the essay. Color digital photo taken at Eckert College, St. Petersburg, Florida in Winter, 2005. 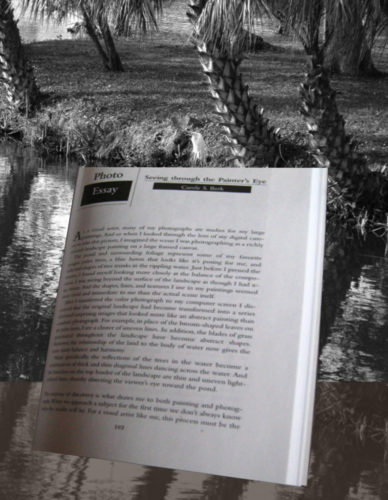 Photo transferred to black and white through Photoshop for cover of Fourth Genre, Creative Nonfiction Journal in Spring 2005. 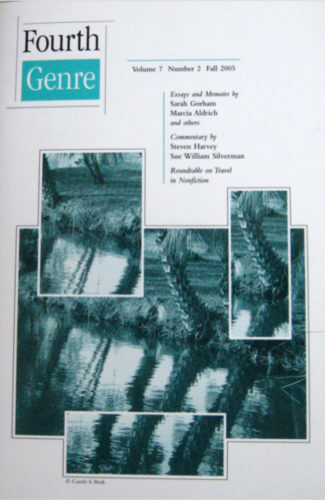 Photo as it appeared on the cover of Fourth Genre in Fall 2005. Essay called “Seeing Through a Painter’s Eye” and black and white photo appear in the journal. The paintings below represent the process of creating a narrative from the original photo, and the challenging experience of having to write an essay for a major literary magazine (remember I am a painter, not a writer).